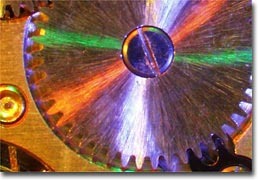 The recording of time has been of paramount importance to mankind since the dawn of civilization. 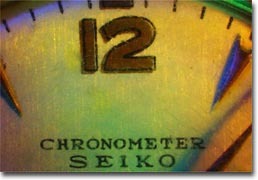 It has been reported that Cro-Magnons kept track of the phases of the moon beginning about 30,000 years ago. Many other ancient civilizations also recorded the passage of time by counting the periodical nature of seasons and the regular succession of day and night. Smaller fractions of time must be divided by artificial devices, and there has been a great deal of energy expended on accurately dividing time into hours, minutes, seconds, and even smaller subdivisions. The ancient Egyptians were avid enthusiasts of astronomy and perhaps the first to realize that the Sun's recurrent movements affected the tides. They recorded the beginning of the yearly flood produced by overflowing banks of the Nile River, and were able to measure a cycle of 365 days, a reasonable approximation of the topical solar year. Egyptian astronomers observed that the star Siris rose in direct line with the Sun on a single day each year, although they discovered that the star appeared about six hours later each year. This convinced the Egyptians to adjust their solar year to 365.25 days. Several years ago, an Egyptian sundial dating back to 1500 BC was discovered, providing evidence that they divided the day into equal parts. Greek astronomer Hipparchus measured the equinoxes, which are the two points in the Earth's orbit at which the Sun's path crosses the equator. The equinoxes mark the winter-spring and summer-autumn seasonal transitions. Hipparchus realized that the equinoxes shifted each year, but the period was slightly shorter than the ancient Egyptians had measured. He calculated a year to be 365.24 days, about 1/100 shorter than previously thought, but Hipparchus was largely ignored by calendar makers of the period. During the 1500s, the Julian calendar was widely used, but was actually 10 days behind the solar year. In 1582, Pope Gregory XIII became alarmed that the calendar shortfall meant that holy days, such as Easter, were being observed on the wrong day. He adjusted the length of the year to 365.24 days, adapted the leap-year rule, and reduced the length by 10 days, to create the calendar most widely used today. During the mid-1600s, physicist Christiaan Huygens invented the pendulum clock and launched a search for a perfect cycling clock that could accurately record time. Although clocks with spring-driven movements had been invented during the 1500s, the need for accurate measurement of time became a necessity as the industrial age began to develop. Clocks of the period were cumbersome and not portable. It wasn't until 1675 that a device called a "hairspring" was invented in England, paving the way for development of the pocket watch. 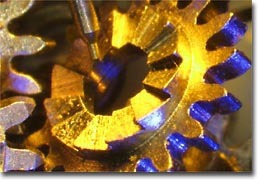 The watches and gears photographed for our galleries were all manufactured a number of years ago. Mechanical watch movements are protected by jewels or synthetic sapphires and rubies that have been machined by drilling, chamfering, and polishing to allow them to serve as bearings for the gears. 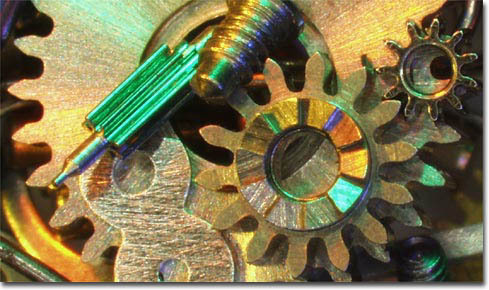 The average mechanical watch has about 15 jewels that support gear shafts and reduce friction. 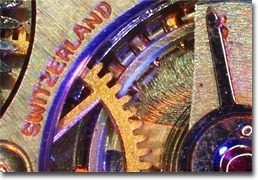 Watch movements are affected by the quality of the jewels and attention to the finishing procedures for gears, springs, and levers. All components should be made from materials designed to withstand wear and tear, and should be finished to a high degree of quality. 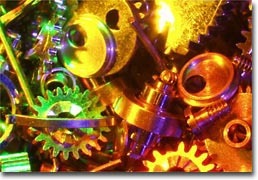 Today, there are a wide variety of alternatives to the mechanical watch mechanisms. Most notable are the wide variety of digital watches that can cost under $10, and are powered by batteries that can last several years. While these digital substitutes often can very accurately record the time, they do not have the style and craftsmanship of yesterday's wristwatches.